Situated along the Sassagoula River, Port Orleans Riverside is a beautiful, meandering resort featuring the Alligator Bayou and Magnolia Bend sections. Within Magnolia Bend are 4 mansion buildings: Acadian House, Magnolia Terrace, Oak Manor, and Parterre Place. This area is designed to favor the grand southern plantations with beautiful foliage, well manicured lawns, and gorgeous architecture. The Alligator Bayou is meant to resemble the rustic charm of small towns along the Louisiana Bayou. Within the rooms at the Alligator Bayou, you will find hand-carved wooden furniture, and other rustic accents to complete the bayou feel. Tip: Upgrading to a preferred room here is a good idea due to the size of the resort. There are evening carriage rides offered between Riverside and French Quarter. The cost is $35 for a 25 minute ride that can accommodate up to 4 adults or 2 adults with 2-3 children. 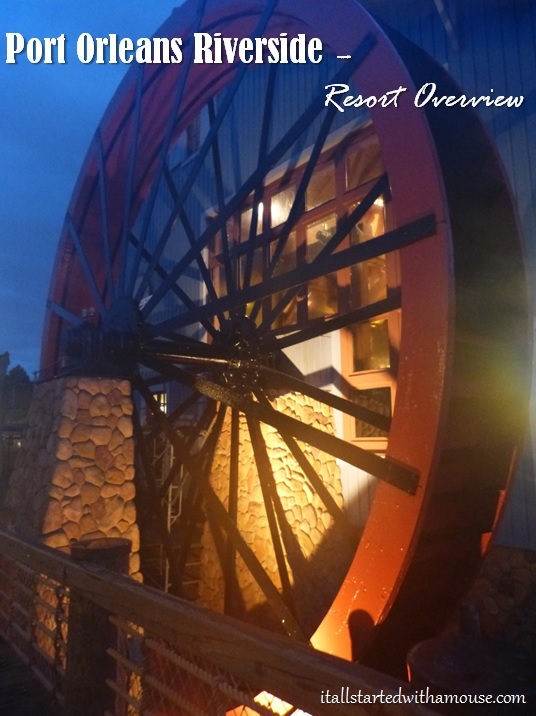 The carriages depart from Boatwright’s at Riverside between the hours of 6:00PM and 9:00PM nightly. Longing to bike along the Sassagoula? Bike rentals are available at the Dixie Levee marina. They also rent out rowboats, canopy boats, pedal boats, and surrey bikes. The pathways throughout the resort and along the river are perfect for biking, walking, or jogging! More than 500 rooms at Riverside are “Royal Guest Rooms” that feature special touches inspired by Disney royalty, such as Princess Tiana. They have fiber-optic headboards, custom bed and window coverings, and special artwork. Rates for these rooms are higher than standard rooms at Riverside. Boatwright’s Dining Hall is a table service restaurant at Riverside that is only open for dinner. This casual dining experience serves Cajun and American style food. Menu items include: jambalaya, voodoo chicken, Cajun catfish, barbecue ribs, shrimp and grits, and more. Riverside Mill is the counter service food court option at Riverside. It features a few different windows including: Pizza ‘n’ Pasta; the Grill Shop which includes burgers, chicken nuggets, fried fish; the Carving Station with freshly sliced turkey; Specialty Shop with sandwiches and soup; and the Bakery with pastries, cookies, ice cream, and more. Standard rooms at Port Orleans Riverside have either 2 queen beds or 1 king bed. Rooms are also available with 2 queen beds with a fold-down bed or 1 king bed and a fold-down bed. All rooms have 1 window (corner rooms have 2), a safe, a hair dryer, a coffeemaker, a mini-fridge, a TV, an iron and ironing board, a ceiling fan, and free wi-fi. Limited room service is available. Laundry facilities are located near each of the 5 quiet pools with 3 in the Alligator Bayou and 2 at Magnolia Bend.